Depending upon which trainer, what range, or the particular gun related video that you may be watching, there will sometimes be more “rules” than these, but there should never be less. Especially at sporting events involving firearms usage, there will likely be many restrictions that are counterintuitive to “practical” usage. This is as it should be. At open enrollment events, the proficiency of those in attendance cannot be underestimated, regardless of “profession”. 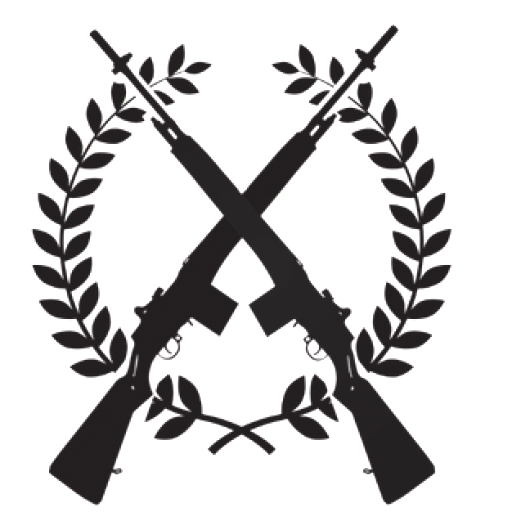 The following is aimed primarily at the serious firearms practitioner who recognizes that there are no reset buttons regarding defensive firearms handling and usage. You must handle your firearms properly, all the time. 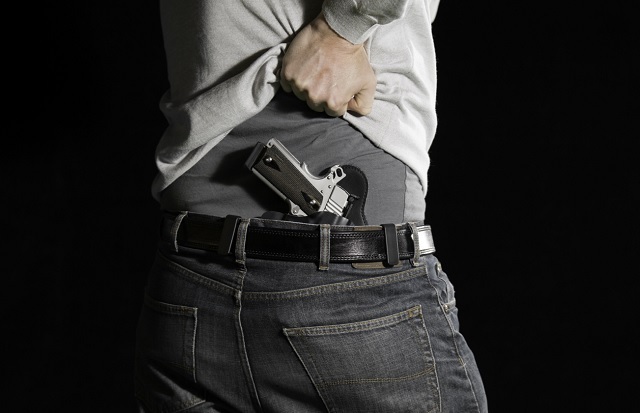 These rules, when fully committed, and ingrained, into your default behavior when you handle any firearm, will preclude virtually all negligent discharges and if you should have a legitimate accidental discharge, the consequences will be minimal. These rules are equally as, if not more, important in “tactical” settings whether or not you are a police officer serving a high-risk warrant, warfighter moving to contact, or homeowner investigating the sound of broken glass at your residence. You must not shoot things, or people, that you don’t intend to shoot. The firearm you are handling is a tool. It will act only according to input onto the operating and control mechanisms with which it has been designed. This means ANY input on the trigger or other mechanisms, human or otherwise, will cause that part to operate in the manner in which it was designed. Control the environment of that tool, and the opportunities for anything to interface with it, whether it is in storage in your safe or on your person in a ready condition. Foolish and careless handling or behavior is the mark of an idiot that is soon to become a tragic injury or death. The rules are purposefully redundant and overlapping. To negligently discharge a firearm, you must violate two or more of these rules. Don’t be that person. Treat all guns as if they are ALWAYS loaded, all the time. This rule, all by itself, will eliminate any situation-specific or variable decision making that may serve to confuse you. In your mind, you will only handle firearms in one manner whenever you handle them at all. No confusion, no uncertainty with variables, i.e., “I handle guns this way when “at the range”, or this other way when I’m “tactical”, or yet another way when I’m “just at the gun store”. Guns are supposed to be loaded. From a defensive perspective, they are no good to you unless they are loaded. Just like your car is no good to you unless it is fueled. You expect the car to be fueled, and otherwise functional, to some level or other because that is the normal condition of a functioning car. When you activate the ignition system, you reasonably expect your car to start. When you activate the fire control system on a firearm, it is reasonable to expect it to function as designed. A Negligent Discharge (ND) refers to anytime a firearm discharges through negligent handling. It is always a result of mishandling the firearm on the part of the person doing the handling. An “Accidental Discharge” (AD) pertains to some sort of mechanical breakage or system failure that occurs internally, that the shooter had little or no control over, and causes the firearm to function without direct input to the trigger mechanism. Accidental discharges are exceedingly rare. Almost all unintentional discharges are preventable by proper gunhandling. If you think a firearm is unloaded, and you are compelled to handle it, the first thing you should presume is…it is loaded. If you don’t know the proper clearing procedures for that firearm, leave it alone unless there is some overriding reason to do otherwise. While following ALL of the 4 Cardinal Rules of Firearms Safety, perform Unload and Clear Procedures. No one knowledgeable in firearms handling will be offended by you double checking a firearm, at any time. Anyone who objects to your emphasis upon safety is displaying their disregard for proper gun handling, and by logical extension, everyone else’s safety in the area. They are quite possibly dangerous due to this lack of concern. Do not allow their recklessness to affect your safety protocols. Conduct yourself accordingly. Here is a short vid on my $.02 worth of flashlight “wisdom”. A modern compact flashlight with a LED bulb is powerful, very durable, a potentially effective “weapon of opportunity” if needed, yet is often neglected in an Every Day Carry inventory. These 3 affordable flashlights will cover most of your portable lighting needs from general utility to portable floodlight. These are not the final say at all on flashlights. This topic is always good for a vigorous conversation. However, these three will cover a wide variety of needs from general use to wide illumination, and tactical/self defense needs. Even if you bought all three at once, you would not break the bank. This little guy is so convenient to carry it eliminates all of your excuses to carry an actual flashlight. True, it’s not quite up to the eye blinking chores of the “tactical” or defensive lights, but it puts out a very decent amount of light and will certainly be useful when you are trying to find your way out of a darkened office building when the normal lights go out. Now we’re into some eye flinching power. Yet, both of these are affordable, compact, and quite heavy duty. It you could only pick one light to take with you, one of these would be fantastic. This is quite the bargain considering you almost can set things on fire with it. Just kidding, but it is really bright at 2,200 lumens of diffused light coming out of a moderately sized package. It doesn’t have the same focused hotspot as some other lights, but that’s an attractive feature. With the high output, this light is a handheld floodlight in a small size. The optional 18650 recharging kit lets you reuse batteries for repeated usage while maintaining the option of using a fresh pack of CR123 batteries if the rechargeables are down. Of course, this is not the last word in flashlights. We haven’t even started to talk about weapons mounted lights, head lamps, filtered lights, etc. And what about all of the different sizes, types of batteries, form factor, price, etc. Look for another post on other lighting categories. Nice group, mediocre group, or Heroic group? What is the context? Quite often in the learning curve of any new endeavor, and especially after the newness wears off, the new student will begin to inquire as to what level of competence will suffice for their needs; what is “good enough”. Usually the answer entails entails something along the lines of, “well, what is your goal…right now?” Then, the rest of the evaluation and answers develop from there. What is the skill level of the shooter in reference to the featured picture? What were the marksmanship, mechanical, and mindset problems for the shooter to manage? Time, distance, distractions, the “goal”, shooter and/or target movement all matter to provide context. This shot group, all be itself, tells very little. What is the rest of the story? I ran across this post, Minimum Competency for Defensive Pistol from “Stuff from Hsoi” and wanted to summarize and share the high points with you. There is quite a bit of detail about some of the evolutions of defensive shooting standards from some very well known trainers, some of their variants, along with the reasoning and pros/cons of developing “standards” in the first place. This is certainly one of the many areas where I absolutely acknowledge that I am benefitting from the expertise, wisdom, and experience of others so that I might improve myself, and by extension, improve my students. 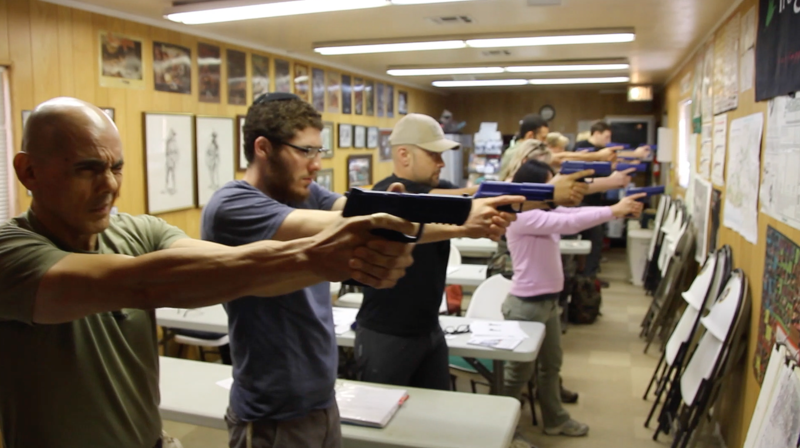 Defensive Firearms Instruction conducted a Use of Force and Self Defense Laws Class at Angeles Shooting Ranges. This class was an introduction into the world of criminal law and law enforcement procedures that is not often taught. However, in this increasingly litigious world where even the most righteous acts of self-preservation are microscopically criticized with vicious social bias, it is imperative that a personal defense plan include more training than came in the gun box. When contemplating the legal aftermath and potential consequences of a deadly-force incident, the knowledge on how to become “hard to convict” is most valuable. Jeff Cooper referred to this as the Second Battle. The class started off with a video clip of a couple out for a walk in a semi-remote park area. When they are suddenly targeted in a “knock-out” style attack the realities of violence immediately grabbed the DFI students’ attention. Even though the video clip was a planned and supervised stress inoculation training exercise, it graphically demonstrated how fast and how violent people can be to each other. The audience was then challenged, with their present level of legal knowledge on the topic, to justify the actions of the defender in this “pre-quiz”. 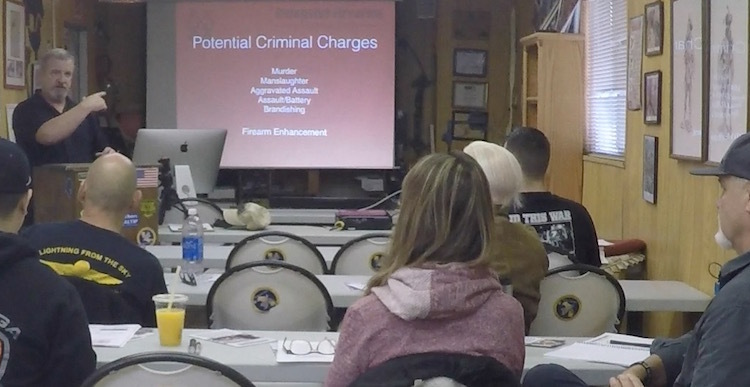 Some tactical answers were proffered, but this class was more about the legalities of a defender’s actions, not whether or not the tactics were “good”. This set the tone for the remainder of the day where vigorous student-instructor interaction was a constant theme. Learn the laws of use of force. Be able to legally justify your use of force. Stay out of jail. Don’t settle for the defensive training that came in the box with your gun. Your concealed handgun is NOT a talisman, or a “warning sign”, or a “shield”, to be flashed when you get a bit scared of, or uncomfortable with, the smelly transient who is begging for money in the parking lot or at the gas station pump. Your fear must be REASONABLE before you may use force…not just to you, but to a reasonable person. And yes, merely displaying your firearm can be considered a use of force, also known as assault. There are a host of other legal elements and crimes that you may inadvertently commit through your ignorance of the law as well. You must not violate any ONE of them to be able to legally claim self defense. Your actions will be judged and evaluated by reasonable people (the jury of your case) who will be told, through jury instructions, that you should have known the various elements of the laws of use of force. Your opinion, if not reasonable, does not count. If you cannot support your claim of fear of death or great bodily injury with evidence and facts, and you threaten someone with force, you are at risk of criminal prosecution. Congratulations to the newly promoted #Krav Maga Unyted Black Belts! 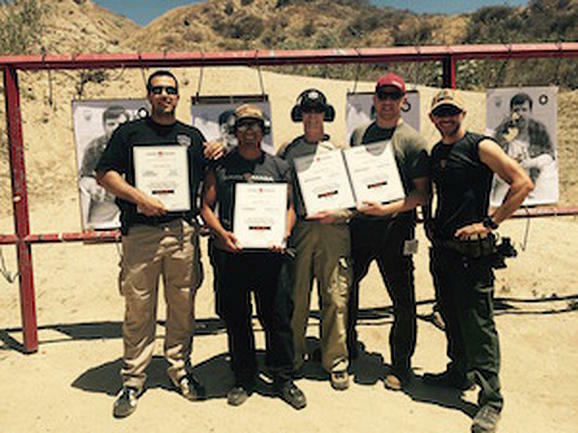 ‪#‎JarretWaldman‬ treated his Krav Warriors to introductory handgun and shotgun familiarization on the Tom George private range at Angeles Shooting Ranges with DFI as the Firearms Instructor. All shooters demonstrated open minds to learning new tools and techniques along with safe tactical gun handling skills. Well done, gents! DFI has also participated with Krav Maga Unyted in providing KMU Intermediate Level members with realistic stress training drills that blend unarmed combatives with armed, live-fire drills. You won’t see this type of training too often outside of specialized military or law enforcement units. But you will see this if you train with KMU. Congrats again to the new Black Belts of KMU. 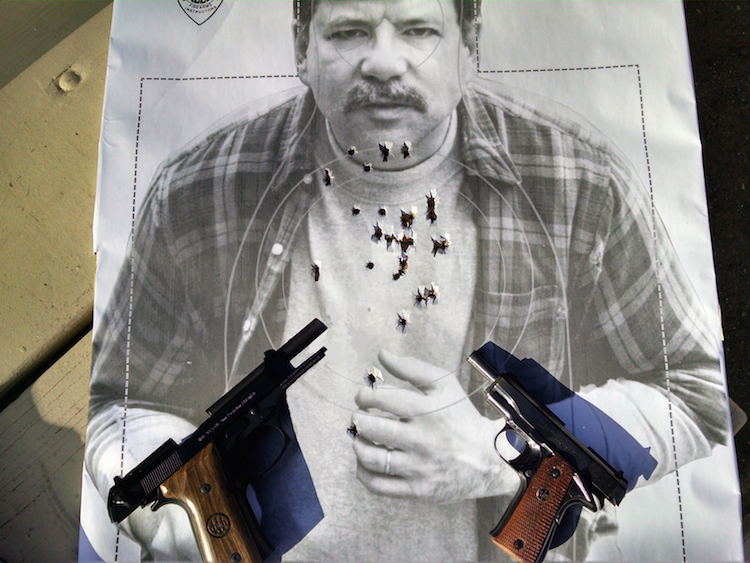 Hope to see you back at the range soon. Tiger McKee writes for The Tactical Wire. His column on mental control during and after a violent confrontation is absolutely a must read. Your emotions must be controlled, while you make appropriate defensive decisions/actions thoughout the violent encounter. Having said that, it bears noting that merely “reading” about a topic or watching a video of a skill does not adequately commit that experience into the subconscious mind for use during a stressful encounter. Vigorous, first hand experience does that. Read the entire article.